Seven and Hannah Lewis (photo by Nina Chistel). 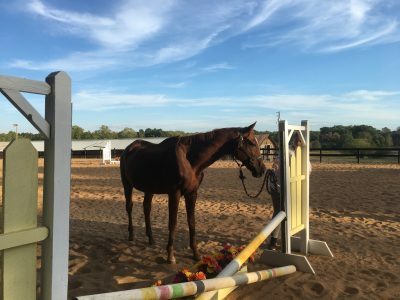 It’s been two months since 11-year-old thoroughbred Souper Spectacular — also known as 2010 Horse of the Year Zenyatta’s little brother and, at one time, a $1.15 million yearling himself — was rescued from a Georgia kill pen for the bargain price of $390. 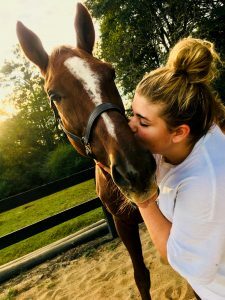 And it’s safe to say life has significantly changed for both the big chestnut gelding and also for the grateful family credited with saving his life. Under the care of Georgia native Mistie Moore and her daughter Hannah, the once emaciated chestnut has gained more than 200 pounds, has recovered from the chronic rain rot covering his body and is past the foot abscesses that plagued both front feet. Even better, he’s gained celebrity status in the OTTB rescue world and has been honored with his own billboard and even a website. Now named “Seven” (see “The Sad Tale of Zenyatta’s Little Brother” for an explanation), the once million-dollar thoroughbred has made great strides in both physical and mental recovery, though still has a ways to go, according to Moore. At first, Seven was limited to stall rest and hand walking, but within the last week he’s been allowed a full turnout, though he’s not completely comfortable yet. “Before he had supervised turnout at night, but now he’s in a big paddock during the day,” Moore explained. “But he doesn’t go far. He always stays within yelling distance of the barn. The rain rot is all gone and his coat is coming in very deep red and shiny. Seven has gained “at least” 200 pounds since he was rescued, Mistie Lewis says (photo by Nina Chistel). Moore said that Seven has gained “at least” 200 pounds since his rescue on Aug. 11 and is a good eater. He is still fed an entire bale of alfalfa spread out over the day, as instructed by his veterinarian, as well as all the oat hay he wants. He also eats two quarts of senior grain and beet pulp daily, but will soon be slowly weaned back on the amount of alfalfa over the next few weeks. He is also given several supplements, including hemp, which was donated by a fan named Jenna Brown of Hope Botanicals and which Moore said has made a big difference in his appearance just in the last couple of weeks. “He’s starting to lose his ribs,” Moore said. “It’s like he’s filling in from the bottom [of his stomach] up. It’s so funny because now he makes other peoples’ horses look small because he’s so big. He loves his peppermints and carrots, but his absolute favorite is oatmeal cream pies. He is crazy for those. For now, Moore said, there are no plans to start riding Seven and that he will get at least 12 more weeks to just be a horse before they consider putting a saddle on him, though they will start to introduce a bridle and more hand walking. Knowing thoroughbreds well, Moore also knows that as Seven’s health and disposition improves, so will his spirit and his need to be more active. Souper Spectacular, now known as Seven, continues to thrive in his new surroundings (photo by Nina Chistel). 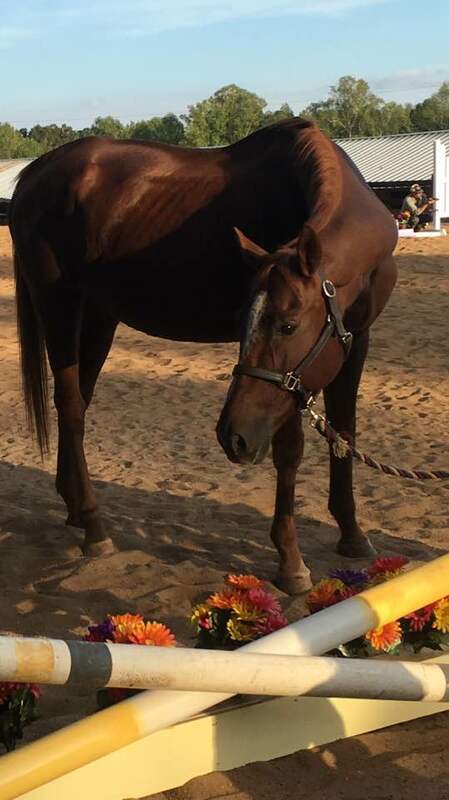 Recently, Moore says, the woman who brought Seven to sell at the Eastanollee, Georgia, livestock auction on that hot August night reached out to her to update her on the other thoroughbred that was up for sale alongside Seven. Moore said she didn’t even think it was a thoroughbred at the time — his coat was in such poor condition she believed him to be a palomino. In addition to more than meeting the $10,000 Go Fund Me goal Moore set up to help with the expenses of rehabilitating Seven, people from around the world have reached out to offer kind words and send gifts. For the most part, Moore says, people have been supportive of Seven’s plight and she and her family have, for the most part, successfully navigated the treacherous waters sometimes surrounding horse rescue and sudden notoriety. “I’ve said it before, we planned on taking care of all of Seven’s needs ourselves,” Moore said. “People kept wanting to help us and were persistent, so someone suggested a Go Fund Me — that’s it, that’s the only reason [for raising money]. Ninety percent of people who have reached out have been positive, just a few have been negative. And it’s mostly been Hannah dealing with all of it and I’m so proud of her, especially the negative. “And that part was mostly about the money. Again, we didn’t need it, but people felt good about helping. So, after some discussion, we decided to let people help. Some people didn’t understand, but I don’t really care. 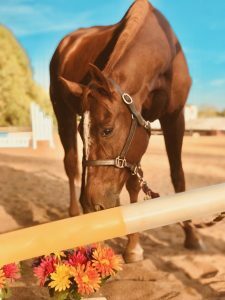 “I cannot even explain how much his care has cost, but I’ve kept every receipt of every penny spent and if there is anything left over I will either use it to rehab another one or donate it to another OTTB rescue,” Moore concluded. Seven (photo by Nina Chistel). Steven Crayne of the Georgia Horse Racing Coalition, which supports the return of pari-mutuel racing to the Peach State), arranged for a billboard celebrating the gelding’s rescue and also helped set up a website to keep his now thousands of fans worldwide informed about his life and progression. Crayne believes the rehoming issue overall to be in crisis mode and hopes attention on situations like Seven’s will help all former racehorses. “My friend, who owns the billboard company, has rescue horses and dogs and cats on his farm and volunteered the space to help them raise money,” Crayne said. He also offered his perspective on the OTTB rescue crisis overall. “I don’t think they will ever solve the [rescue] problem. In my opinion, the industry needs a supply chain executive to look at the entire thoroughbred industry supply to determine what it will take from all vested interests to secure the funding to take care of horses throughout their career. Otherwise, groups are going to be begging and pleading for money ‘til the end of time. “Maybe there is something out there,” Crayne continued, “but I have never seen a complete analysis of how many horses need to be taken care of how much will it cost to take care of them ‘til the end of their life. How do you tax every vested interest? And, at the end of the day, is part of the problem too many horses? As Seven settles in to his forever life, Moore is certain he knows he’s been saved and shows her his gratitude every day. What he doesn’t know, though, is how grateful Moore is for him coming into her life. Lost in her daily life as a wife, mother and grandmother, she says as happy as she was in her life, Seven changed her.